When the first spears of blue bulbs push forth from the warming ground in spring, my heart leaps at the sight of seeing their caerulean or blue-violet pools across the grass. Daffodils and tulips may monopolize the press in the flowering bulb world, but they cannot steal attention from the so-called minor bulbs. The minor implies unfairly some deficiency or inadequacy as if the bulbs will never match or compete daffodils and tulips in showiness. However, they have a celestial quality in their starry shapes, blue or white colors, and the power in numbers. Thankfully breeding has not aggrandized their flower sizes or heights. The little blue bulbs appear as soon as they disappear in rising temperatures and longer days, never tarrying like some daffodils and tulips. 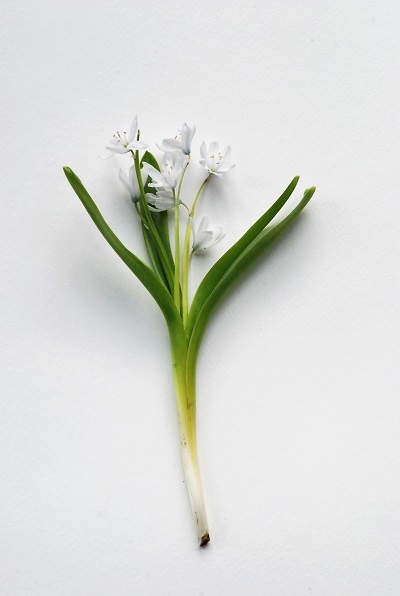 One of the earliest to come is the alpine squill, Scilla bifolia, from the mountainous regions of central and southern Europe to Turkey and Syria. It seemingly senses the warm microclimate, always surprising me with its presence especially during mild winter spells. The moment Scilla bifolia breaks through the soil, the color of the buds is already developed. From each bulb comes a pair of lance-like leaves, accounting for its specific epithet ‘two leaves’, and 1-6 scapes of starry blue flowers. Each individual flower has six tepals that appear iridescent like sapphires in the light. Some people feel that other blue bulbs surpass Scilla bifolia in intensity and size. However, the multitude of flowers borne on one bulb compensates amply, and a carpet of naturalized bulbs matches other species. For the true blue that equates to the peacock plumage or Morpho butterfly wings, Scilla siberica obliges willingly, if not too successful. There have been some concerns that this bulb has been successful in natural areas to the point of being classified as an invasive. Large colonies of Scilla siberica have established in the Upper Midwest, outcompeting with the native wildflowers, and some people have discovered controlling it to be difficult. I have not been seen problems with this Russian and Eurasian native at my workplace, probably due to the vigorous turf grass and other competition. Scilla siberica produces 4-6 leaves and 2-3 flowering stems with at least 6 flowers. Each flower is pendulous, attractively striped dark blue with white bases. There is a white form ‘Alba’, which seems to miss the point of growing this species. Sometimes sold under Scilla tubergeniana, Scilla mischtschenkoana was a serendipitous find in the wild-collected batch of Puschkinia from northwestern Iran to the Dutch bulb nursery Van Tubergen in 1931. The confusion with Puschkinia is understandable for both share the same icy pale blue with darker veins and the strappy pale green leaves. However, the difference lies in the flat and fused filaments of Puschkinia and separate ones of S. mischtschenkoana. Another difference, an important cultural one, is that Puschkinia can push forcefully through thick leaf mulches whereas Scilla cannot. It is common to see S. mischtschenkoana flower precociously at the same time as snowdrops and tommie crocuses. 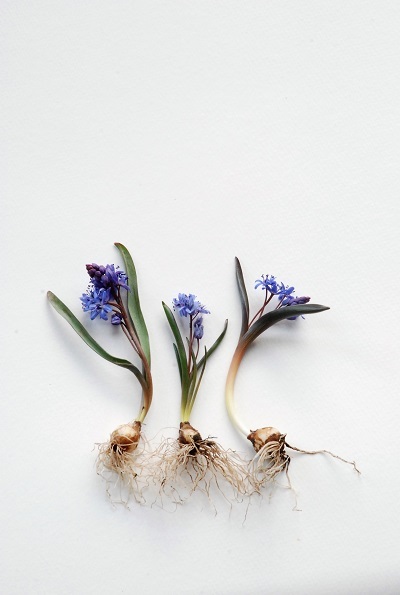 As if in a rush to capitalize on being the spring frontrunner, Scilla mischtschenkoana will flower partially above the ground and before the leaves develop fully. UP NEXT: Chionodoxa, now sunk into Scilla.